Please refer to our stock # 3334 when inquiring. 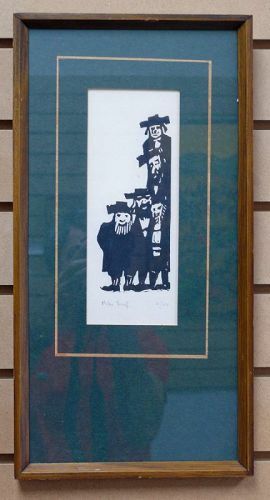 Mike Leaf, Lithograph, Five Rabbi, ca. 1970 ed 4/100. Lithograph 8" x 3 1/4", Frame 16 1/4" x 8 1/2". Mike Leaf was born in London, England in 1934. He spent his youth wandering through North and Central Africa. He arrived in Israel in 1954. A member of Kibbutz Amiad, he parachuted into Sinai in 1956 and was severely wounded. Like many untutored artists and writers, he held a vast range of unconventional jobs until finally settling down to full time painting in 1968. Since then he has participated in a number of group exhibitions and one man shows. Mike Leaf searched for a number of years for a means of expression that would reflect his provincial surroundings and yet be relevant to the times. On a six month working trip to Mexico and Guatamala in 1981 he was much influenced by the 'primitive' wooden sculptures found in the small village churches of the interior. On returning to Safed he began experimenting with various materials and developed a mixed media based on papier mache. His knowledge of color and form, gained after seventeen years of oil painting and lino and woodcut printing, was then used to color the finished pieces. In 1996 he spent some months in Bali, Indonesia, living in a small village of wood carvers, learning from them the traditional carving techniques. Besides sculpting he continues to paint and produce lino, woodcut and silk screen prints. Since 1985 he has operated a gallery in Safed where there is a permanent exhibition of his works. In 2003 he was awarded a grant from the prestigious Jackson Pollock Krasner Foundation of New York. He is a self taught artist.